This will be my first how to makeup post. I hope you enjoy this, please let me know if you want any specifics and let me know your thoughts about this to. Smokey eyes is one of the latest makeup trends. After many celebrities, especially Kim Kardashian, use it. Smokey eyes become the ‘go-to look’ for many people. 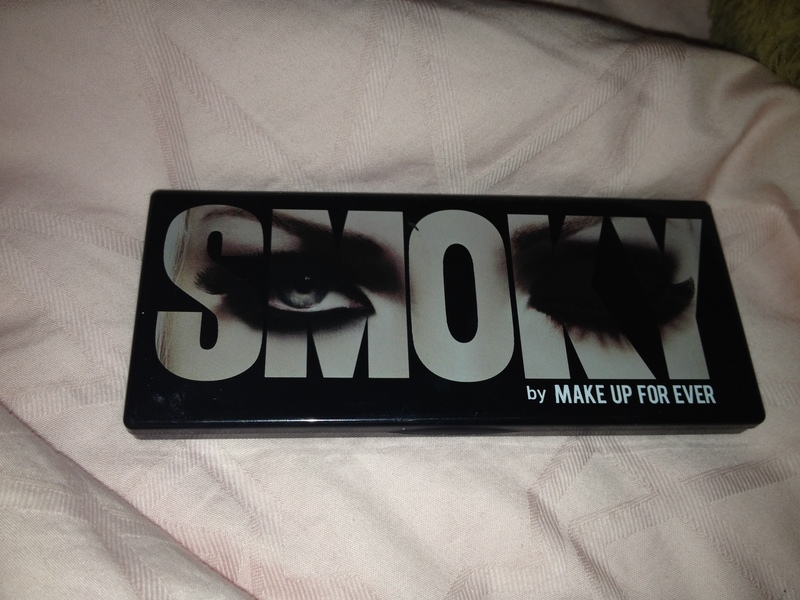 I myself personally, love smokey eyes. Because it’s quick and it is easy to transform from your daily makeup and night makeup. 1. Prime your eyes with any primer. My favourite are: Urban Decay Primer Potion or the Too Faced Primer. But if you are not willing to spend too much money on primer it’s fine, you can even use your concealer. On this model, I used the Too Faced primer. 2. Use Kohl Pencil. Kohl pencil (preferably in black or dark blue) will make your job so much easier. It directly increase the intensity of the colors because it’s just so strong. You can use any kohl pencil, on this model however I used the Make Up For Ever Kohl pencil. Tip: if you have the ‘typical asian eyes’, like the model, put the kohl pencil up to your eye lid. If you do not have the asian eyes but rather ‘hooded eyes’ then you can estimate it, it shouldn’t go too high. 3. 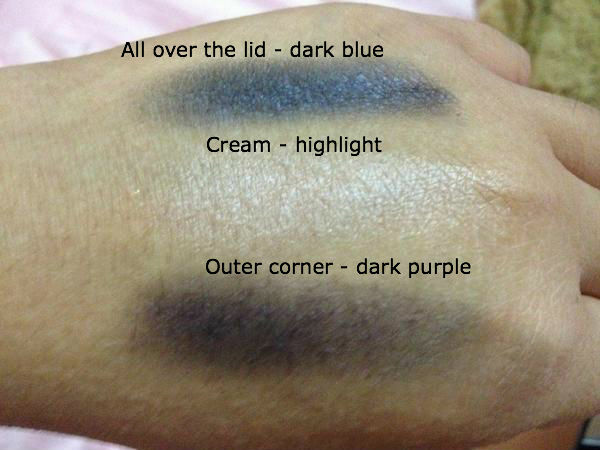 Blend the color from kohl pencil. Do it by upward direction. On this step, you can already see the smokey effect. Remember you will still need to put eyeshadows on top of it so it could be a bit messy. 4. Top it with dark blue eye shadows. If you do not wish to use dark blue, you can change it to other colors. 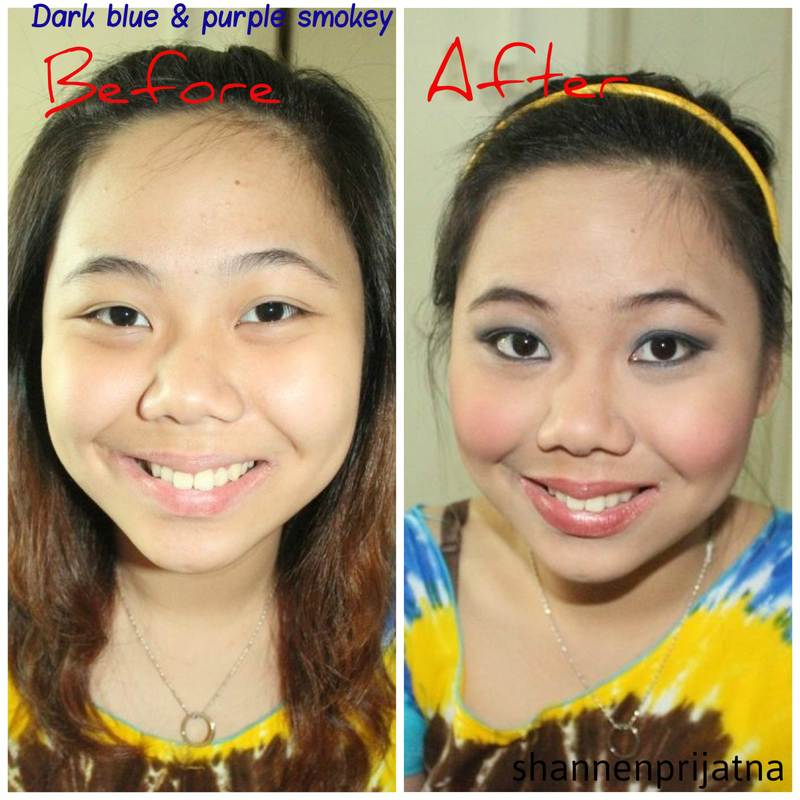 On this model, I used the dark blue from Make Up For Ever Smokey palette. This dark blue should go high enough until around your crease. But remember don’t go over your crease, if you are good at approximating, slightly lower than your crease will be good. Because you will need to blend in, because harsh line in makeup is a crime. Tip: if you have the asian eyes and feel like you don’t have a crease! Don’t worry, your crease is the part right under your brow bone (you can try to feel it first now!). Also, always remember when you place your shadow, when it gets to the end, make sure it goes upwards. So your eyes won’t look dopey! 5. Add a dark purple on the outer corner, making a slanted V. This was not necessary, if you want a quick one, you can skip this step. But I added it to play with more color. What it does is that it adds more color to the eyes! Since it’s daily makeup, I do not recommend black (though if you want to then it’s up to you), because you want to keep it soft and more natural. So dark purple or darker blue would do. 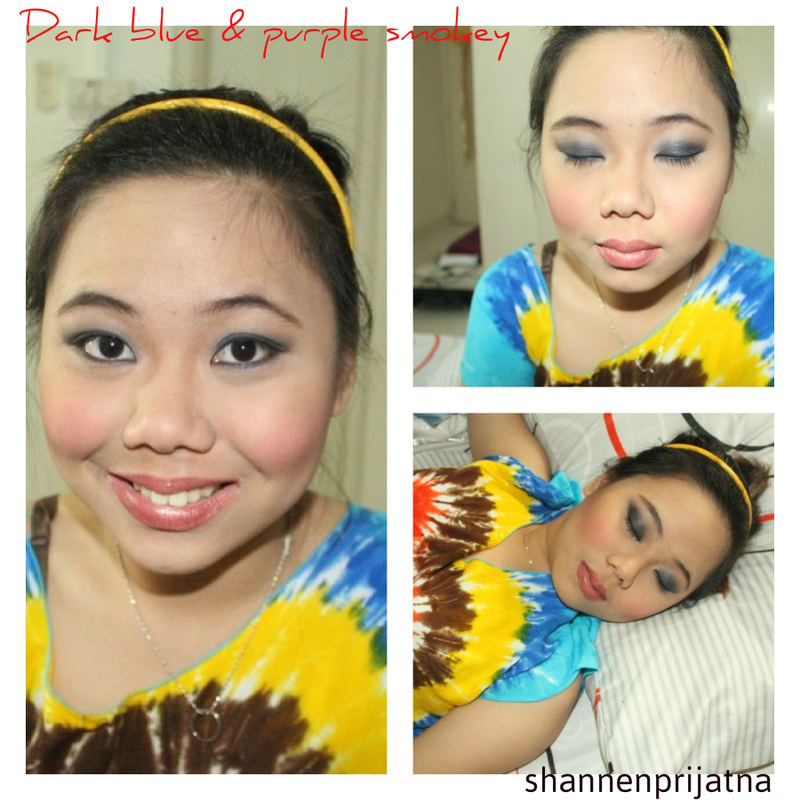 On the model, I used the dark purple from Make Up For Ever smokey palette. 6. Blending your colors! This is an important step that YOU MUST NOT SKIP. 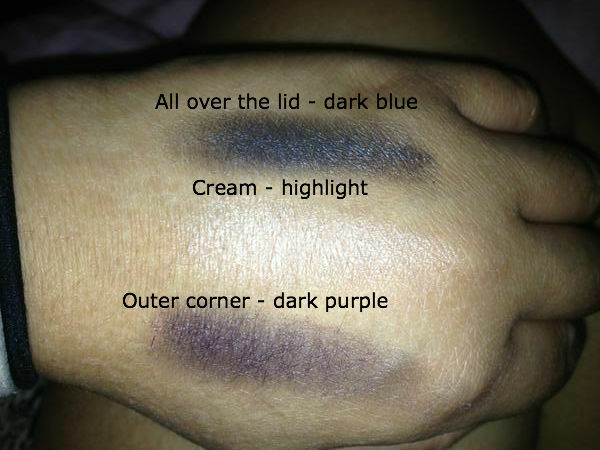 When you blend, you should blend in left and right direction, like a car’s window wiper. Do not put much pressure. You can also blend in upwards, but remember not too high! Tip: to blend you can actually use the same brush as the brush you used for your eye shadow brush. But remember, to blend, you need to have a clean brush! So clean your brush first! 7. Line your water line. Use any black eyeliner or the same Kohl pencil. On this model, I used the same kohl pencil from Make Up For Ever. 8. Add dark blue below your waterline and make sure you join it! 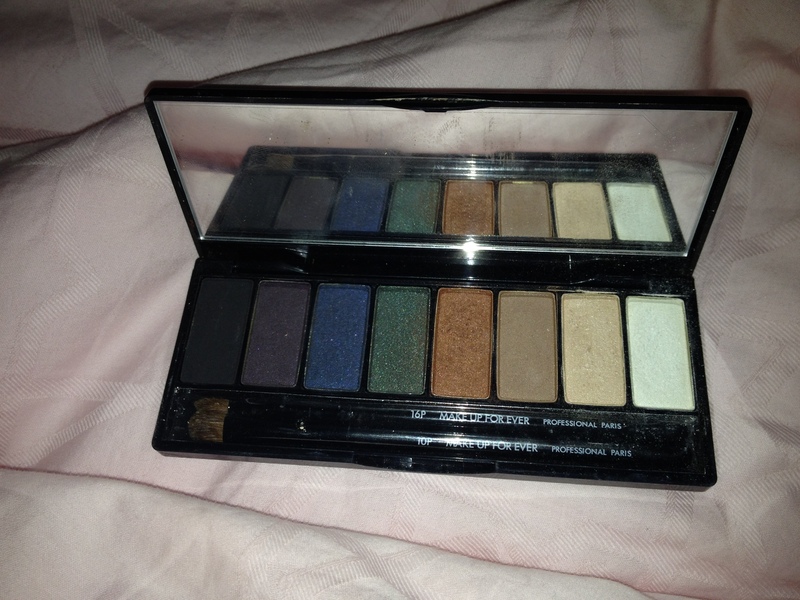 This is the same dark blue or color that you put on your eyes. If you used a second color, then you can add the dark purple (or whatever it is) only one the outside of your eyes (you don’t need to go all the way in). But again, make sure you join it. 9. Highlight. To highlight you just use a bright color, perhaps white or cream. Then put this under your brow. It can also help to soften the eye-look. On this model, I used the cream color from the Make Up For Ever palette. 10. Curl your lashes and add some mascara. On this model, I used the Shu Uemura curler and Make Up Forever Smokey Lash Mascara. That is all you need! After you do it a few times, you can do this in 5 minutes! If you are interested to know how you can transform this look to a night look, please let me know. Or keep waiting, because I will post about it soon! Let me know if you have any questions. I will answer it as quick as possible. – Too Faced primer, Make Up For Ever Smokey Palette (dark blue, cream, and dark purple), Make up Forever Kohl Pencil, Shu Uemura lash curler, Make Up For Ever Smoky Lash. On the model’s face, I used: Make Up For Ever Primer (no. 0), Make Up For Ever Concealer, Make Up Forever HD Foundation, Bobbi Brown blush in Peony (no. 16), Make Up For Ever Sculpting Kit in no 2, Make up For Ever Lip palette (no. 15) – neutral tone.